It's almost February and I'm in the mood for spicy, New Orleans food. Mardi Gras is only a few weeks away so I'd like to share my recipe for Jambalaya. I've been making this recipe since 1988. It's evolved over the years. The original recipe was in one of Paul Prudhomme's books. The best part is that you can add shrimp, sausage, chicken or any combination depending on what you have available. I've found that for the sausage, a good fully cooked kielbasa or butcher shop wiener is great. Serve the Jambalaya with or without the sauce. I like to make the jambalaya spicy, and quiet the heat with the sauce. Let's face it, it's January in Wisconsin. Tomatoes are ... well, to keep it polite. They're pale and not the vine ripened beauties we see in summer. I've created a recipe that uses canned tomatoes. Tomatoes picked at produced in their peak. The brand I use is Organic, and whose cans are (or will be very soon) BPA free. The spices are dried, and the rest of the ingredients are very easy to find. 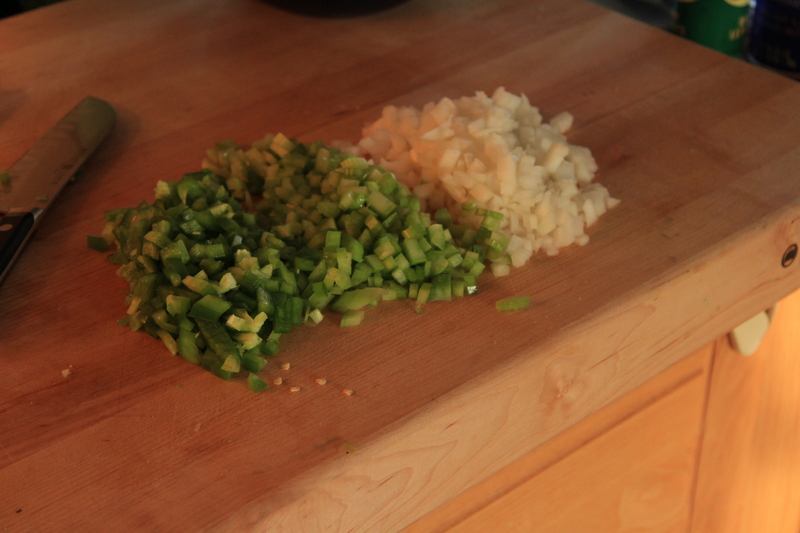 Every Creole or Cajun recipe uses the vegetable trinity of onion, celery, and green pepper. Chop them in equal sized pieces, and in equal parts. Since you'll be making both recipes, you can do your chopping all at once. Don't worry if you don't measure exactly, just try to be close to equal parts. I love the sight of vegetables all chopped and ready to go. Here are the triplets, ready for the heat. The spice mix is the perfect balance and heat and flavor. The onions should begin to look translucent. Once you've cooked the vegetables, turn up the heat and add the chicken and stir in the seasoning mix. At this point, you'll know you're able to make the best meal ever! You'll smell the spices and know it's pure New Orleans. Add the stock, tomatoes with puree, and rice, then crimp foil around pan and place in the oven. NO PEEKING! You may want to move the mixture to a small baking dish, then cover with foil if you're having trouble getting a good seal. Relax, have little libation and start the sauce. I like to think of the sauce as a nice way to use the leftover vegetables, and spices. The spice mix is just a little different, and somewhat sweeter. This time you're going to use butter. Melt the butter, and add the onion, green pepper and celery. Add the spice mix, and stir to combine. Add about 2/3 of the can of tomatoes, and the stock. Add a few dashes of Tabasco and a few pinches of sugar. Simmer while the jambalaya is cooking. The picture below is the Jambalaya just after the foil came off. You'll want to gently toss/fold the Jambalaya after you remove the foil and the bay leaves. The tomatoes will be at the surface. This will gently mix them together. Be sure to taste the rice to be sure it's completely cooked through. Sometimes I've needed to add more stock and place it back in the oven. This is due to the type of rice and the amount that it requires. Can you smell it yet? The sauce is delicious! Use it with other dishes too. It's great with eggs with spicy sausage. To serve, I mound the Jambalaya in a flat soup bowl, and top with the sauce and chopped scallions if desired. Serve with a great crusty roll. The recipe will serve 4-6 people. Preheat your oven to 350 degrees F. Heat the oil in a stock pot or large saucepan. 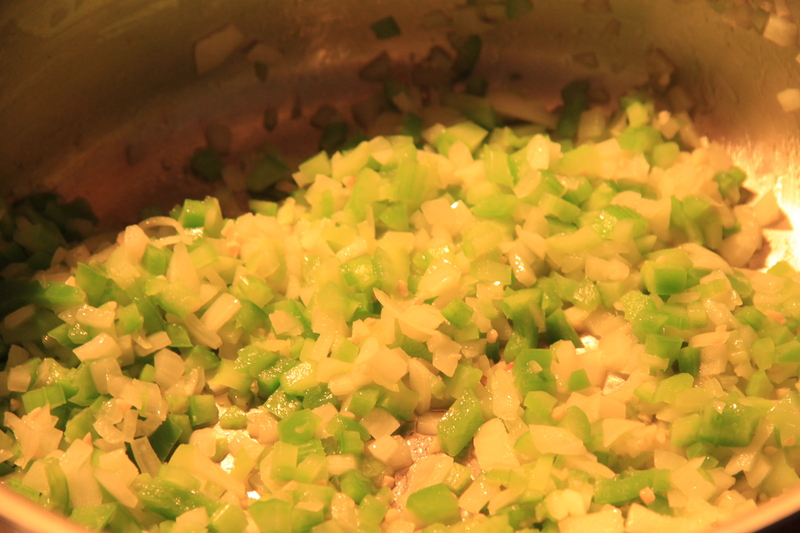 Add the onion, celery and green pepper and cook over medium heat until the onion is becoming clear. Turn up the heat and add the chicken. Cook about 3 minutes, stirring to toss the vegetables and the chicken. Add the seasoning mix, and cook about 2 more minutes. Add the garlic. When the chicken is white, and appears cooked through, add the tomatoes and the chicken stock. Bring to a boil, then add the rice. Heat though, add shrimp and and sausage. Transfer the mixture to a baking pan. A deep 8x8 or 13x 9 will work depending on how much meat you're added. Seal the top with foil and place in the oven for 30-45 minutes. The rice should be soft, not crunchy and the liquid mostly absorbed. If you prefer the rice softer, the mixture can remain in the oven longer. In a large saucepan, melt the butter, add the onion, celery, and green pepper and cook until the onion begins to look clear. Add the spice mix and stir to combine. Stir in the stock and tomatoes. Bring to a boil, add the sugar/honey and Tabasco. 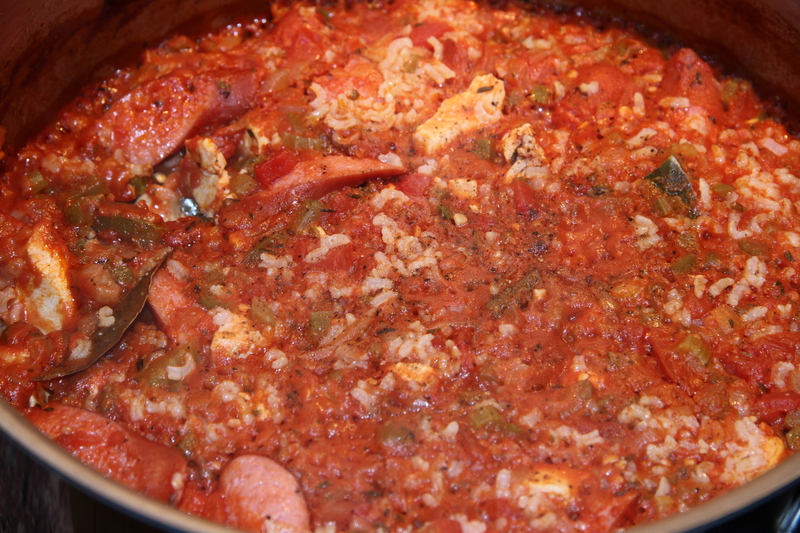 Reduce heat and simmer uncovered while the jambalaya cooks, about 30-45 minutes. The mixture will reduce and thicken. If it becomes too thick, add chicken broth. Be sure to remove the bay leaves before serving. This recipe will make about 2 1/2 - 3 cups.